How to put file links into MS OneNote with drag-n-drop? I was always using drag-n-drop to put links (paths) to the files in OneNote document. Now I lost this ability: if dragged, files are copied onto page in entire volume. Why the feature has dispappeared and how to restore it? As you see, there is no option to insert a link. If I drag DJVU file, I has no prompt at all and have the file embedded into the page. OneNote version is 14.0.7116.5000 (64 bit) from MS Office 2010. 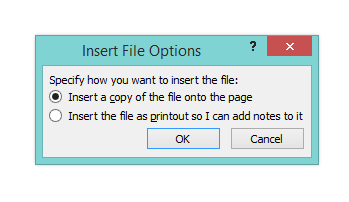 As you see, it had 3 options with one option "Insert a link to original file" which now gone. Browse other questions tagged microsoft-onenote microsoft-onenote-2010 or ask your own question. How can graphics be anchored to text in OneNote? How can I extract the embedded files store in a OneNote 2010 .one file?